Three flowers at a time – we love multiple-bloomers! 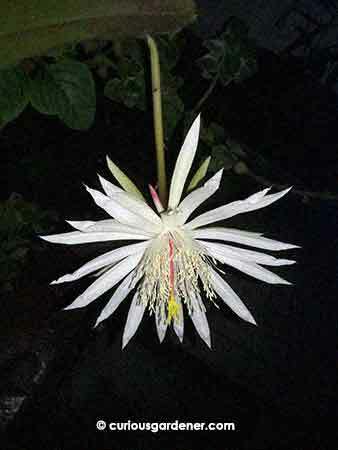 So the new white Keng Hwa flower plant that I bought from World Farm finally decided to bloom! I was intrigued to see that the flowers are smaller than what we’re used to, and that there are subtle differences in them. These flowers look so pristine because they’re all white. Ghostly, almost… And, the petals are shorter and broader than our original plant’s. 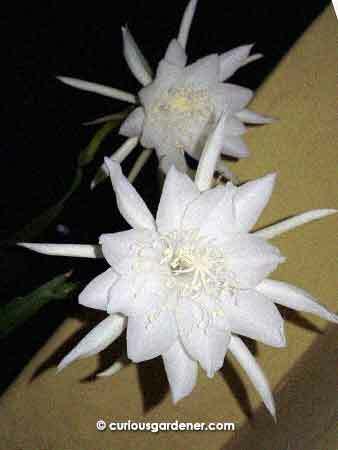 The perfume of the flowers was also not as strong, and it appears to be a more willing multi-flower bloomer. Our original Keng Hwa flower has the eye-catching red and yellow stamen, and an incredibly strong aroma when it blooms. Our usual guide to when they’re blooming when we don’t expect it, is the heady perfume that invades the house late at night – something that the smaller flowers can’t do as well. I can’t get over how cute a baby pineapple looks with those purple flowers! This is the ratoon fruit. I am the great procrastinator. I know that when we harvested our ratoon pineapple last July, I said I was going to detach the sucker that had started growing on the parent plant. I say a lot of things but don’t always follow up on them. So, yes, we now have a second ratoon pineapple developing on the parent plant! And, that sucker has not one, but TWO siblings growing along with it! Seeing the new pineapple start to grow finally kicked me into action, as I figured the plant would be able to devote more energy to developing the fruit if it didn’t have to also support extra suckers. I easily detached one that was higher on the stem – it came off with a little bit of twisting – and planted it nearby. The second sucker, however, proved to be stubborn. It was lower on the stem and was leaning over a bit. I twisted it, and I yanked it, but it wouldn’t break off. Common sense made me stop, because the entire parent plant was rocking away, and I didn’t want to traumatise it and lose the new fruit. What I think has happened is that the sucker has taken root in the ground, because they do start to grow roots when on the parent plant, and it’s near ground level. I can’t tell for certain, though, because of the spiky leaves in the way. Does that make it a new, independent plant, or is it still a ratoon? So, taking stock of things, here’s how we’ve multiplied our pineapple plants over the years: We started with the single plant that bore a beautiful, delicious pineapple. We replanted the top and harvested one sucker, and left the second sucker to try growing a ratoon pineapple. When we harvested that ratoon pineapple, we replanted that top, and the parent plant ended up growing another three suckers. One is now beginning to fruit, one has been detached and replanted, and the third has possibly taken root by itself. So, we started with one plant, and ended up with eight! Two have been harvested, and six are currently growing. Ratoon fruit in the foreground, with the likely rooted sucker next to it. The detached sucker is in the background. I guess this is going to be a pineapple bed. 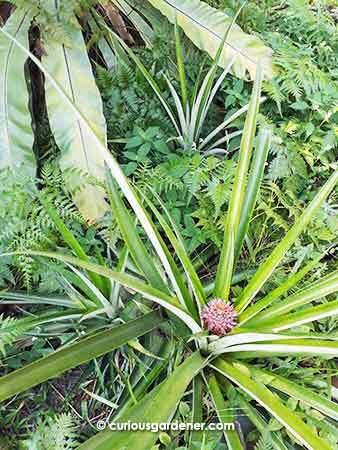 This brings up another question – how many suckers can a pineapple plant produce in the course of its lifetime? 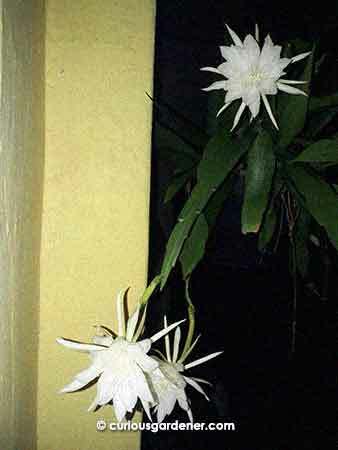 The original plant has already grown five. That being the case, we could have the beginnings of a pineapple plantation on our hands! It has taken six years to reach this point, though. 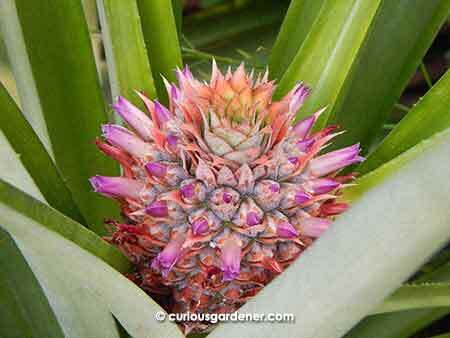 You have to be really patient when growing pineapples! Spreading out like the promised land… lots of flowers in this section! The last several weeks have been super busy for me, hence the lack of gardening developments and blog posts. I think last month was the first month I’ve ever not blogged since starting The Curious Gardener! 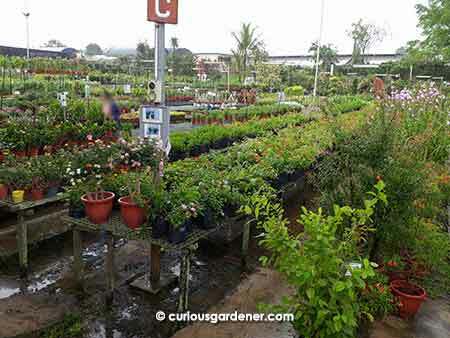 It’s not fun when life takes up all your time and energy that you can’t garden… Well, a friend and I needed to decompress, so last weekend we went to the famous plant nursery, World Farm (properly known as Hua Hng Trading Company), at Sembawang Road. 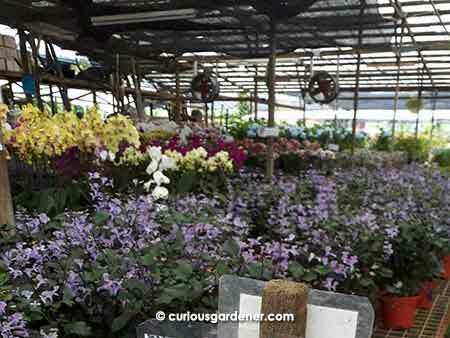 For plant lovers in Singapore, it’s like a trip to paradise because it’s big and the turnover of merchandise is fast. To quote my friend, the variety of plants can change every three days… I don’t know how true that may be, but they do have a good variety of plants from all over the world – fruit and ornamental trees, and flowers and herbs – as well as gardening accessories. Some areas were empty because we assume things had been brought to the Singapore Garden Festival at Takashimaya that weekend. The herb area was particularly bare, but I managed to get a replacement pot of mint since I’d lost mine during the hot season. I also was on the lookout for different varieties of the keng hwa plant that I’ve mentioned here several times. Why? Well, my friend has a very prolific variety that we’re a little envious of, plus we’ve also heard of a variety with red flowers. I was fortunate to find both types at the nursery that day. The red one looked like it had been recently potted and didn’t have any flower buds to show, but the white ones did. We hope both plants acclimatise to our home and start to flower in the not too far future. Dragonfruit plants are in the same plant family, and I was interested to observe a few mature plants there, especially how they were propped up. Flowers that need less sunlight? They’re lovely when in a large cluster! 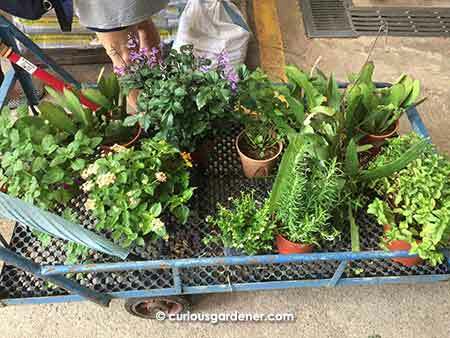 I also couldn’t resist getting some flowering plants – not as many as I’d wanted to, but there’s always another trip! If you haven’t been to World Farm, you’ll find it at 15 Bah Soon Pah Road, Singapore 769962, and if you go on the weekend, go early to beat the crowds, or visit during the week. 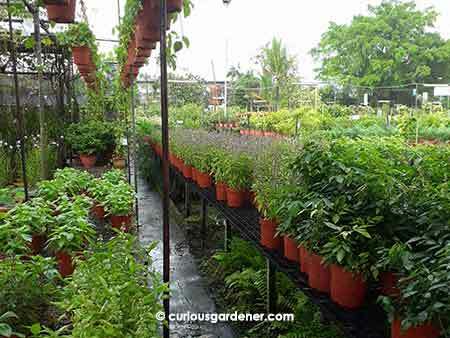 Don’t forget to use the handy carts when selecting plants! 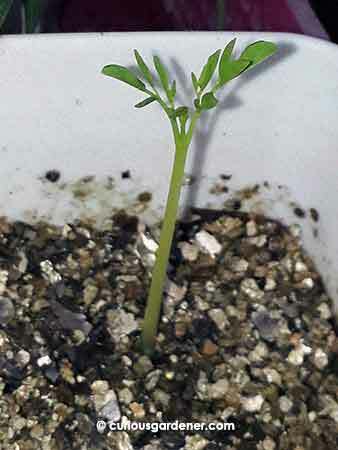 First leaves of the moringa plant. I’ve been attempting to grow moringa for a while now – quite a few times, actually. We call it the drumstick tree – so named for the long bean pods that may or may not resemble drumsticks. Those pods, when cut into short lengths and added to curries, are a delicious find. The outside of the pod is thick and fibrous, but the insides soften into a jelly-like texture that you scrape off and eat with the curry gravy. It sounds odd but is simply yummy! Since my dad enjoyed eating curries, he grew the tree once, a very long time ago. The tree grew about two storeys high and was quite abundant. What Dad didn’t know then was that it isn’t a hard-stemmed tree. When strong winds blew by, the branches broke easily. After a couple of times, Dad decided it wasn’t safe to grow it as he had situated it next to the fence and didn’t want to damage the neighbour’s property. And that was the end of the drumstick tree in our garden. Moringa seeds have a rather hard casing. I cracked them open a little to hopefully hasten the germination process. Fast forward to the present, and we now have more information on the plant. Imagine my surprise to learn that the drumstick or moringa oleifera tree has many more uses than just the edible pods. Just about every part of the plant can be used – the pods are edible; the seeds yield an edible oil called ben oil; the roots can be shredded and used as a condiment (they taste like horseradish); the young leaves are edible, etc. 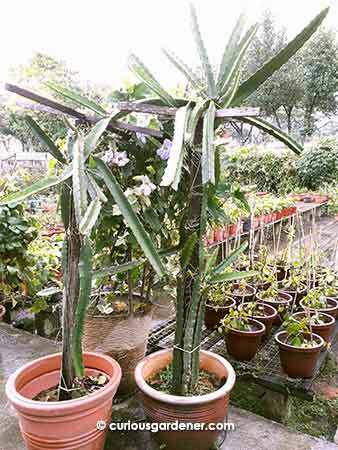 It has many positive purposes, and grows well in semi-arid to tropical and subtropical regions. My interest in it at the moment is also that in permaculture, it is considered a good “chop and drop” plant, where you prune it often and use the chopped branches to mulch the ground. Germination in progress… our first moringa plant! Moringa seeds have a surprisingly hard casing. 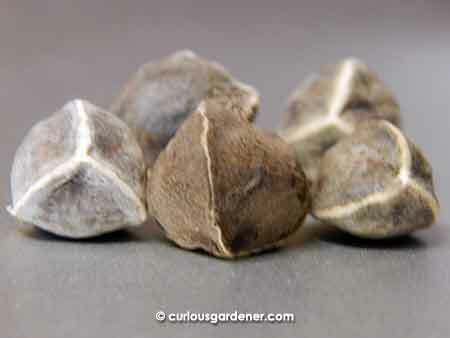 They look light and papery, but the triangular seeds are sealed tight! Since I was impatient to get a plant growing, I decided to crack open the seeds a little to give them a little head start. 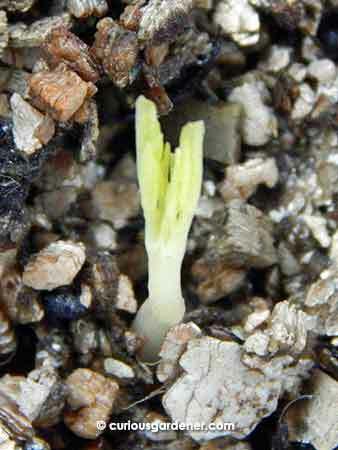 In spite of that, it still took almost two weeks before the first seed germinated. It was a thrill to see the little seed leaves beginning to push upwards. No, actually I don’t think they were seed leaves. When opened fully, they looked like regular tripinnate moringa leaves. Ready for a bigger home now, the moringa plant is almost two weeks old here. Almost two weeks later, there are a couple more sets of what I’d ordinarily call true leaves, and I think this baby is ready for a bigger home. Dare I plant it out in the garden? Not yet. 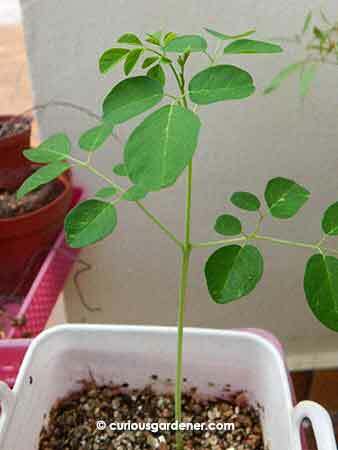 There are hungry snails out there, and this is a tender, young plant – and at the moment, our only moringa plant. Nope, I’m going to coddle it a bit longer until it grows a thicker, taller stem that snails can’t munch right through. Fingers crossed that that’s not just wishful thinking!